Whether you’re looking to paint a brand new home or give an old home a fresh look, Shepherd’s Company’s painting and wallpapering services will deliver results that impress. Our workmen are trained and diligent; we will consult about your needs when evaluating your job, and will work energetically throughout the whole project. Whether it is the assistance you need to help decide the best color finish, or determining which paint to use for maximum longevity, our experience will provide you the care and attention and turnaround time you need for any type of job. Our experience with commercial and residential painting, wallpaper application and removal, and staining means we’re equipped to make your walls look like new. Whether it’s a kitchen, bathroom, family room, great room, foyer, or staircase that needs painting, we have the knowledge and expertise to ensure it’s done quickly. Vaulted ceilings, crown molding, and other trim work are easily handled by our team of professionals. 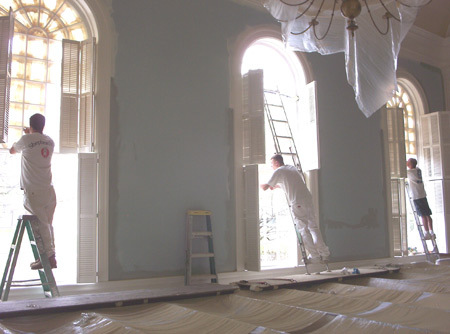 Even high or vaulted ceilings such as those found in churches or large rooms can be handled by our painting professionals. Whether your home or building is brick, wood or stucco, our exterior painting services can dramatically improve its appearance. 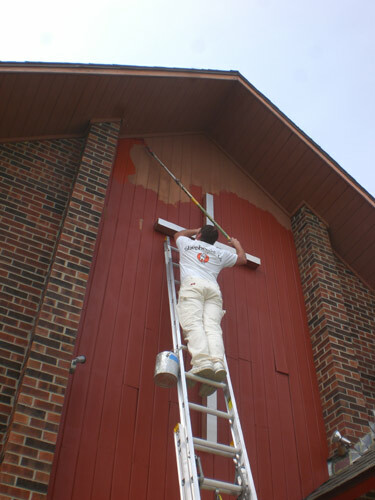 With our residential and commercial exterior painting and staining services, expertise with each type of exterior surface means we know the proper preparation, and the proper way to apply the paint. Wallpaper can be challenging to apply, and even more challenging to remove. Improper removal can damage the wall beneath, and improper application can lead to buckling or wrinkles and bubbles. That’s why it makes sense to rely our on experience to ensure the job is done right- our crew has worked on Mid-Missouri’s walls for over 30 years. We have the expertise to get the job done promptly. If you hire over 30 years of experience, you can rest assured your project will be done right. 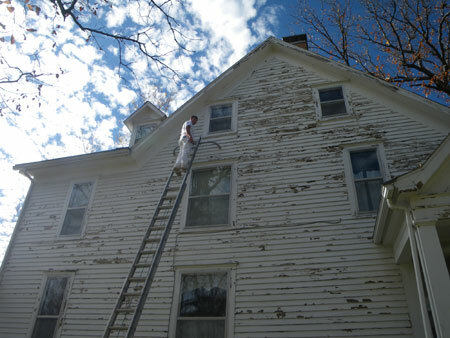 Shepherd’s Company offers professional painting, staining, and wall-papering that will leave you satisfied – guaranteed.